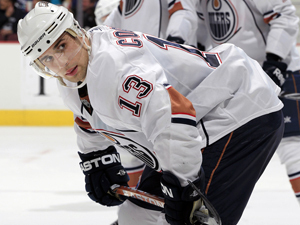 Cogliano, 24 (6/14/87), appeared in 82 games for the Edmonton Oilers last season, collecting 11-24=35 points with 64 penalty minutes (PIM). Cogliano has not missed a game since making his NHL debut with Edmonton in 2007-08, appearing in all 82 games in each of his four NHL seasons. The 5-10, 185-pound center ranked fifth on the club in scoring and assists, third in game-winning goals (3), and led the team in games played. He also paced all Edmonton skaters with a career-high 461 faceoff wins. 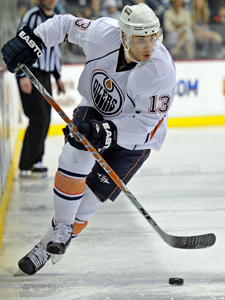 Originally selected by Edmonton in the first round (25th overall) of the 2005 NHL Entry Draft, Cogliano played two seasons with the University of Michigan (CCHA) from 2005-07 prior to advancing directly to the NHL in 2007-08. The Toronto, Ontario native has appeared in 328 career NHL games, scoring 57-89=146 points with 137 PIM. He set career highs in goals (18), assists (27) and points (45) during his rookie season in 2007-08 and matched his career high in goals in 2008-09. We dabbled in this a bit over the last year and a half. The biggest thing for us is speed. We tried to increase our team speed the last couple of years and we really haven’t accomplished that. He can definitely skate. He’ll get in here. He’s a very good kid. Unfortunately for him, he was in Edmonton at the time when they were at the bottom trying to work back up and it was a bit of a rough go. He has a fresh start here. I have no idea where he is going to play here. That will be for Randy and him. The chemistry that happens through camp and through the beginning of the season will determine where he plays. He was a great college player. I remember watching him at Michigan. He went into Edmonton right away because that is where they were at that point in time. Sometimes that sets a guy back a bit. I’m not saying it did here, but sometimes you have to be careful. He went in and scored a bunch of goals. Last year, he was a penalty killer and a checker. He prided himself on that and did a pretty good job. He’s very versatile and we like that here. I haven’t talked (to his agent). I don’t know if I’m confident or not. If we have to go to arbitration, we have to go to arbitration. We’ll do one-year deals, if that is how they want to go. We’re here. We’re hoping he is a good fit and gets comfortable very quickly here. You never know if it’s going to happen. Sometimes guys don’t want a change of address, but need a change of address. This may be a really good case for that. He improved immensely. He takes pride in that. The only way for him to get ice time last year was to be a better penalty killer and to be a better faceoff guy. He’s proud of that role he did last year. That is a factor. We know we are not very good on faceoffs. We probably have to get somebody else if we can that can win faceoffs also. He was an exciting, fast scorer at Michigan. He didn’t worry too much about his own zone at Michigan. But they were very good then, so he didn’t have to. Dan has come in and provided good depth for us. We did the contract the way we did because we get tired of losing guys on waivers. This way I don’t think we do. He has a chance to play here and if he doesn’t, he is a really good depth player. We have to improve our depth around here. I have said that a few times and we are continuing to try to do that. I’m tired of losing. We are going to try to play better down there. If the kids win, they get the habit of winning. If they lose, they get in a habit of losing. We are trying to make a better environment for our players down there. I’m trying to create a winning environment. I talked to Teemu yesterday. His kids are in a camp and he is out there skating with them he says. We said we’ll talk next week like we always planned. He said he feels good. I’m not surprised. Every year you think it’s going to be a little bit different and it never is. Term is a factor with some things. There are 30 guys out here trying to do this job. Everybody has a different set of circumstances. Just look at Buffalo. Now they are going to spend to the cap ever year. Everything changes for the 29 other guys. They all have jobs to do. Let them go and do whatever they feel is right. This is the first time I have been traded, so I was excited. There was mixed emotions originally, right away. I was on my way to skate and (Oilers GM) Steve Tambellini called me to let me know. I’m excited I’m coming to a team that plays in the playoffs, has great players and continually has great seasons. That is the ultimate goal. I want to be on a winning team and contribute. I couldn’t be more excited. Southern California, that is pretty nice living. I did my best to block all that out. Unless I was getting a call from Tambellini telling me I was traded, rumors didn’t really mean anything. All I really cared about was what my coaches thought of me. When I finally heard I got traded, I was excited because I really feel like Anaheim and Bob (Murray) want me there to contribute. I think that is the best feeling as a player. You want to be welcomed, want someone to like your game and want you to be there. I think I’m a very hard-working guy. I put my best foot forward. I want to do the best and be on a winning team. I feel like I’m a really good team guy. I think I’m in a great fit. I’m good friends with (Dustin) Penner and Lubo. When I have talked to them the last couple of years, they had nothing but good things to say about playing there. With guys like Getzlaf, Perry and Ryan, you feel like the major offensive load is taken care of. Those guys are superstars in the league. I know how tough it is to play against those guys. Not only that, you have Selanne, Koivu and really good players that fall behind those guys. I feel my game has evolved and I have matured as a player. At this point in my career, especially coming off last year, I’m a guy who will create offense but also has taken up the defensive side of things. I played a lot of PK last year, which has helped my overall game. I feel like I can contribute right now at both ends of the rink and that is my goal. That is what you have to do in a playoff-type situation, even though I have never played in the playoffs. I push myself to be the best at what I do. He played in the league for a long time and ultimately, that is my goal. The PK game, which I did really well last year, I think I can keep getting better at. I feel like my speed is my best asset and it always has been. I’m not the biggest guy, so I feel like my speed, skating ability and being able to push the play with tempo is something I can use to my advantage. I had two years where I scored 18 goals, so I feel offensively I can bring a lot to the table too. I think that is something that I believe is untapped a bit. I felt like in Edmonton there were a lot of the same type of players and I might not have gotten the best opportunity in offensive situations. I feel like in Anaheim I’m going to get a little bit of both. It’s my job to come in fit and with a good mindset to try to earn a spot. I think I’ll do that. I talked to my agent today and had a great conversation with Bob Murray, which was very exciting. Anaheim is ultimately the place I want to be. I have just been traded there. They are a team that wants me and I want to be there. I really don’t feel that there will be an issue getting a deal done. The circumstances in Edmonton were a little bit different. There is a lot of things going on there and different players, an abundance of forwards. At the end of the day, they have to move some guys. I feel I will be able to get a deal done. Hopefully it works for me and the team. When you play with guys like Getzlaf, Perry and Ryan, who are really so dominate, I really feel I can take on a role where I’m supporting them in an offensive situation. I feel like I’m skilled enough and have a head for the game where I can play with those guys. But I feel I can do different things. I feel like I can play on the PK. Last year, I took steps in my defensive game. That is something where the pressure isn’t as strong as it was in Edmonton. In Edmonton, we were on a last place team and they were looking at certain places for offense all the time. I’m now coming to a team where offense is generated a little easier. I think I’m going to fill in nicely to that. Knock on wood, I think a lot of it has to do with luck. It’s a good thing that I haven’t missed any games. Ultimately, you want to play and be in the lineup. I’ve done that. I feel like I prepare myself well for sure. I feel like I’m in shape and do what is necessary in the summer to make sure I’m coming in at a high level. I believe it is luck. At the end of the day, I don’t really think about it and it’s not something I dwell on. It’s something I’m fortunate I have done. JD, I obviously didn’t play too much with him this year. He’s a very good goalie. They have Hiller and he is very good. He is a guy who could fill in behind him. He’s a good guy in the room. He’s someone who could play games and get wins. He was pretty good in games in Edmonton. JF is a good guy and a strong player, a big player. He likes to hit and he can fight. He’s a good guy to stick up for his teammates. Those two guys are good additions to the organization for sure. With Lubo, I played with him and know what he is capable of. He’s a great player, great defenseman and a great guy. I’m pretty excited to see him.